We are experiencing an earring renaissance. Never have there been more ways to decorate your lobes. Of course, there are all kinds of studs and cuffs to wrap up your ear. 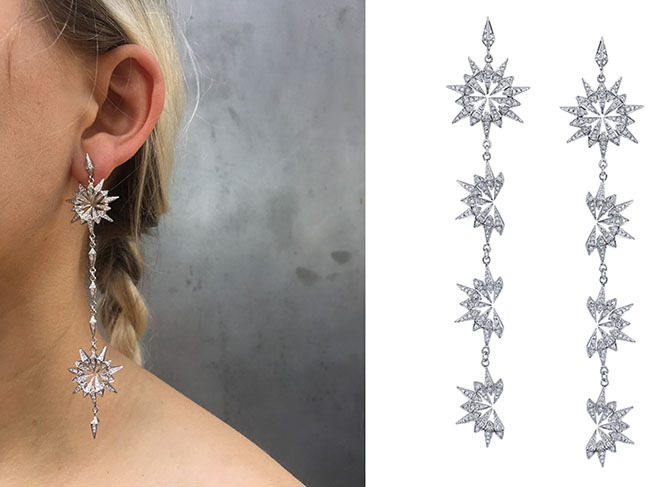 Single statement earrings continue to be an exclamation point style. Just a couple of weeks ago, I wrote how vintage and vintage inspired styles joined the fray. Now, there is another style to add to the growing list. If the theory that three makes a trend is true—and it is—shoulder dusters are back, because I have four. First, you might be asking what exactly is a shoulder duster? The term was originally used to describe slender pendant earrings that were no longer than around 3-inches during the art deco period. They were along the lines of the Cartier art deco diamond and emerald earrings in Neil Lane’s Archive Collection seen here. The earrings didn’t exactly dust the shoulder but the slender shape and pendant at the bottom mildly suggested a feather duster. So, the name was more playful than literal. Over time the term has been applied to any number of long earrings. I think the accurate use is limited to designs that maintain the lean line of the 1920s styles and reach towards the shoulder. New renditions maintain the playful quality of the originals but they are longer starting around 4-inches. The stunning jewels seen here show just what I mean. 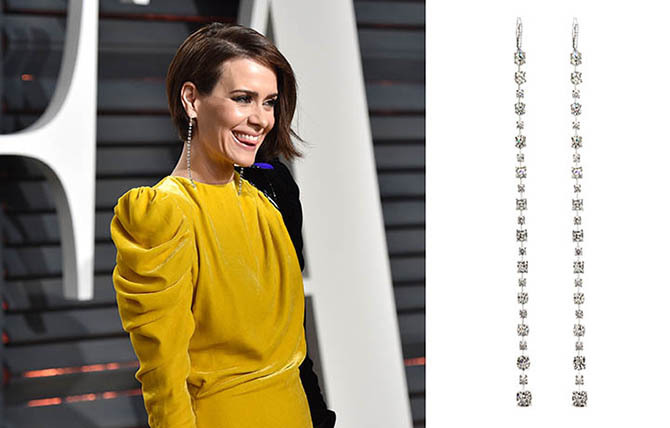 The trend lit up during Awards Season when Sarah Paulson hit the Vanity Fair Oscar Party in a pair of Forevermark diamond earrings created by her stylist Karla Welch. 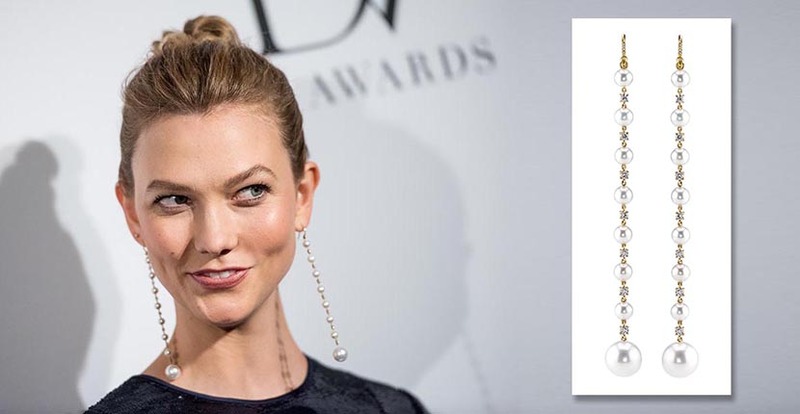 Irene Neuwirth created a fabulous one-of-a-kind pearl and diamond rendition that Karlie Kloss put on pair April 17 for the 2017 DVF Awards in New York. 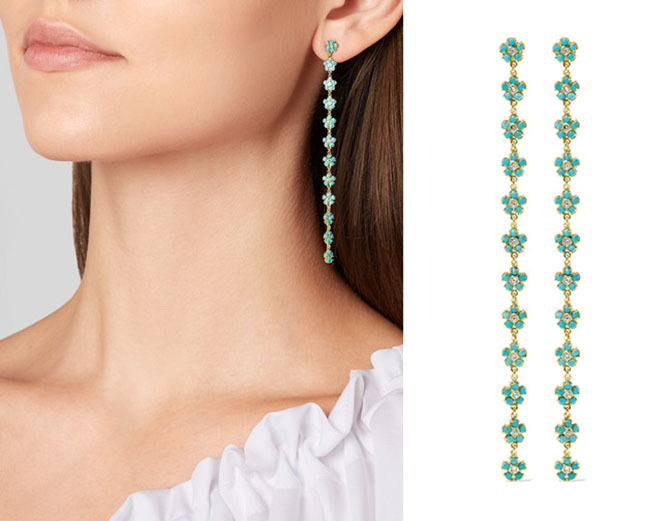 Jennifer Meyer’s shoulder dusters featured on Net-a-Porter have delicate flowers set with her signature stone, turquoise. Karma El Kahlil has several examples in her stunning new Echo Collection.